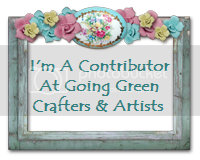 Join us over at Sunday Scrappin’, won’t you? This week’s challenge was to let Christine’s work inspire us. I liked this layout, and while mine doesn’t really look like her’s, her LO inspired me to use circles for the first time, and the ribbon at the bottom is en homage to her LO as well. It is another LO for my Childhood Album. It is a tribute to the house in which I grew up. MATERIALS: PPs: Martha Stewart; Textured Paper: Martha Stewart; Rub-on Alphas: Anna Griffin; Journaling Sheer: Maya Road; Paper circles: Crate Paper; Photo Corners: Jolee’s Boutique/EK Success; Ribbon: American Crafts & Michael’s. I’m also working on a series of “scrapwork quilt” cards in an attempt to use up my paper scraps. Most of the papers are Marrakech (Basic Grey), Paper Source, and Amy Butler Designer Mat scraps. I hand-etched the gold foil ribbon to give it some texture. The decorative ribbon tape is Martha Stewart and the brads are from Queen & Co. I participated in this week’s Creative Therapy. And I made a Father’s Day Card for my dad–his name is Bob, so I altered a vintage Bingo card and each square has an image that has some meaning or significance to my dad. His initials are RVG, so that’s why those are in there! Sunday Scrappin’ Challenge for this coming week: Think about your favorite color. Now, think about what’s on the opposite side of the color wheel… and use those two colors in your project! Hmm…that means I’ll be working with red and green. Christmas in June I guess!! Once again, I’ve been forced to take a hiatus from Sunday Scrappin’. But I return! I’m awfully glad summer is here…I’ll be VERY busy this summer, but my time is more my own. 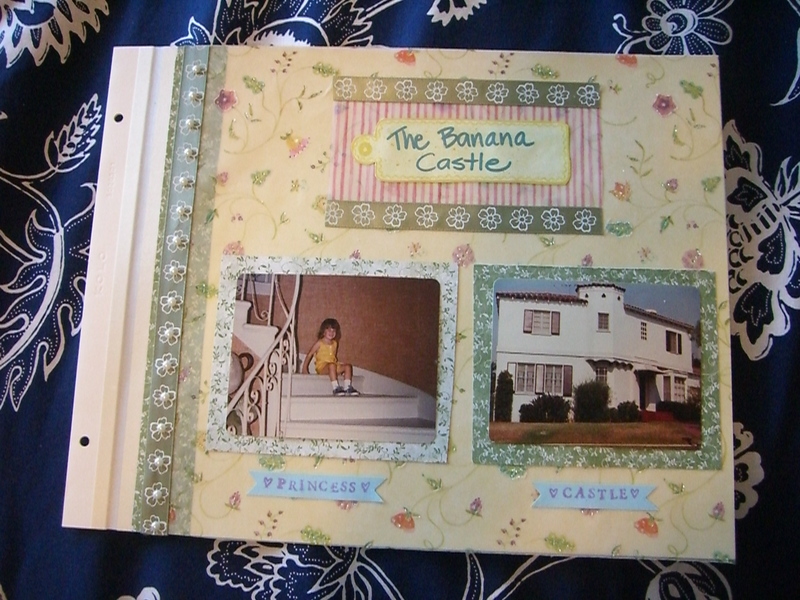 I spent this weekend organizing my craft space, and to celebrate–I did a layout for my “Childhood” album. This is the other side of this layout. This LO posed several challenges. I chose to use bright (but NOT TOO BRIGHT) colors because the photos are old (1979) and the colors are washed out. My bedroom was actually creme and light blue, but there was no sense in tryng to bring that out in these photos. They were taken by my late grandparents and I’m so grateful to have them even though the photos aren’t super. Because I was working on the reverse side of another LO (that had embellishments and texture), the stamping did not come out very well. I covered up the middle stamp with a ribbon and I just let the owl go—live and learn. I’m happy, however, with the colored photo corners. They really made the LO much prettier and helped disguise the fact that the photos aren’t great. The photos were also cropped with rounded corners (which I didn’t like), so the photo corners helped with that. PP: Martha Stewart; ALPHAS: Thickers (American Crafts); RIBBON: American Crafts and Martha Stewart Decorative Tape; STAMPS: owl (Inkadinkadoo) and border stamp (Anna Griffin); INKS: Lavender and Silver (ColorBox); EMBOSSING POWDER: Rainbow Sparkle Lite (JudiKins); PHOTO CORNERS (waste not paper). I’m excited that Christine is going to be co-hosting Sunday Scrappin’. Next week’s challenge is to take a look at her work for inspiration. The inspiration will be easy–it is the execution that might be a problem, LOL! Originally I was going to do all the Creative Therapy catalyst projects on postcards (like this one), but this week’s catalyst required a full-on layout. 🙂 I opted for no journaling, but I’ll give you the scoop here. This is for Catalyst #16: Dream Home. Click on photo to see a closer image. I’ve already lived in my dream home. 🙂 It was the house in which I grew up. We called it the banana castle because to me, at my young age, it seemed as large as a castle and it was painted the color of the inside of a banana. My mother was the Queen and I was the Princess (of course). I think dad got to be the de facto King. In the box of snapshots from my grandparents were quite a few pictures of that house. This was a real treasure for me as I had no photographs of that house/that time in my life prior to discovering that box! In some ways, the house was very much a dream–a dream borne from childhood innocence. I loved to sashay down that staircase, like Anna in the King and I. Even now, decades later, I can still feel the textured wallpaper on the walls, and i can still smell the apricots fresh off the tree in the backyard. I remember the smallest details of that house, down to the decorative shapes on the heating grates. The house no longer looks like it does in that picture but in my dreams it is always my Banana Castle. MATERIALS: Chelsea Vine Flowers Flat Glitter Vellum (Brenda Walton for K & C Co., #635395); recto & verso sides of Bo-Bunny Press Summer Sage Vine #12SGV802 (mat for photos); pink stripe vellum #13306 by Susan Branch for Colorbök; Mark Richards pearls; “Meadow Flowers” ribbon from Michaels; Martha Stewart blue tags; and “Printer’s Type Alphabet” stamps by HeroArts.